Growing up in a household in which the predominant ethnic influence was Italian, I was raised on homemade tomato sauce. (Interesting trivia: The Italian-Americans in Philadelphia refer to it as “gravy.”) As a matter of fact, buying a jar of Ragú was tantamount to sacrilege in my house. That’s really not an exaggeration. Yet as an adult, I never took the time to make my own until recently. Given what I just revealed about my background, you might be surprised to learn that I’ve never actually been much of a tomato fan; I’ve always found the taste to be overpowering and a bit too acidic. However, at the end of August I did a three-day juice cleanse — my first one ever — and I experienced a surprising side effect: Once I broke the fast, I realized I’d developed a whole new appreciation for tomatoes. 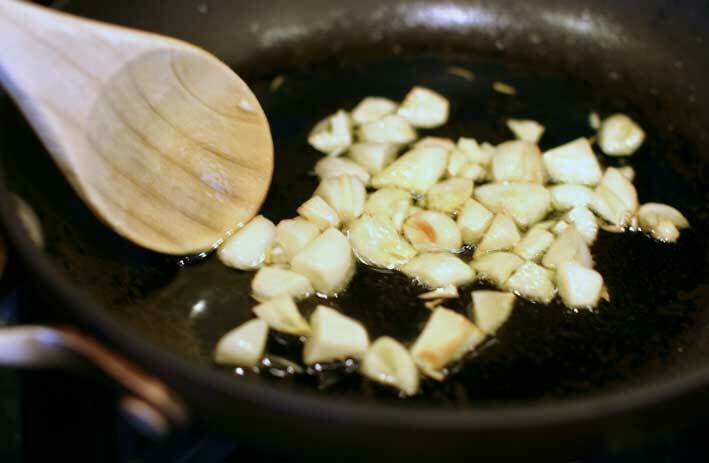 In a small frying pan, heat the olive oil over medium heat. Sautée the garlic until it’s just starting to brown. Quarter the tomatoes, pull the out the seeds with your fingers, then toss them into your blender and blend on high speed for about a minute. I had to do this in two batches to accommodate six pounds’ worth. 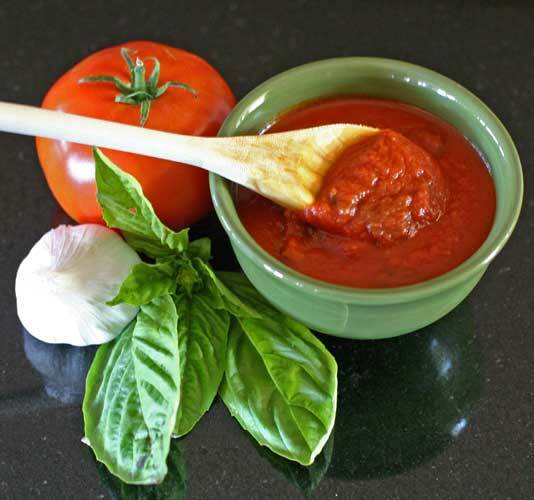 If you prefer your tomato sauce to be completely smooth rather than have chunks of garlic in it, add the sauteed garlic and its oil to the blender as well; otherwise, save it for the next step. Pour your liquid tomatoes into a stock pot. Add the tomato paste, basil and salt to the pot, and if you didn’t already blend the garlic and oil with the tomatoes, then transfer them to the pot as well. Bring the mixture to a boil, and then lower the heat and simmer the sauce for about an hour. Stir occasionally, all the way to the bottom of the pot, to make sure it’s not sticking. That’s it! So simple and so delicious. I store some in a glass jar in the fridge to use over the next few days, and freeze the rest (in quart-sized Ziploc freezer bags — which are BPA-free! — or in an ice cube tray the way I showed you with the pistachio arugula pesto). 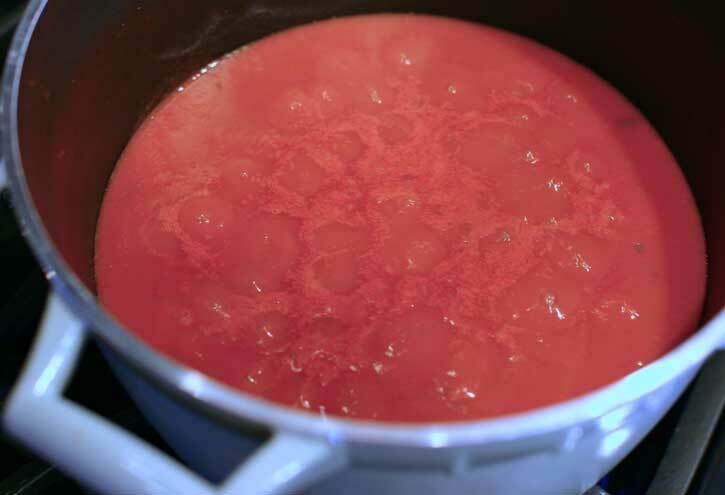 It’s easy to thaw the bag of sauce by letting it sit in a bowl of hot (not boiling) water, or defrost the tomato sauce ice cubes in a saucepan over low heat with a tiny bit of water, stirring constantly. 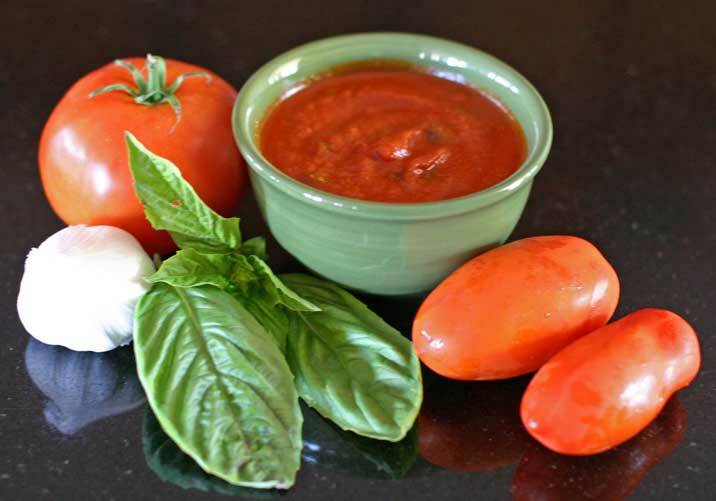 Many families who do make their own tomato sauce do it with canned tomatoes instead of fresh ones. This is extremely convenient due to shelf life; obviously, fresh tomatoes are perishable. However, this convenience comes at a price. Tin cans are lined with a resin coating that contains bisphenol-A, commonly known as BPA. Acidic foods in particular, such as tomatoes, break down the resin, causing the can to leach BPA into the food it contains. Unfortunately, BPA is a synthetic estrogen that has been linked to an alarming number of health problems, such that the FDA banned its use in baby bottles this year. In an article published on Yahoo! Shine, entitled “The Seven Foods Experts Won’t Eat,” University of Missouri endocrinologist and BPA specialist Frederick vom Saal, PhD, shares his advice: “You can get 50 mcg of BPA per liter out of a tomato can, and that’s a level that is going to impact people, particularly the young. I won’t go near canned tomatoes.” Additionally, some brands of canned tomatoes also contain chemical preservatives and a large quantity of sodium, so always check the label. All of these concerns are valid for any canned food, so it’s a good idea to buy fresh foods and dry goods (beans, lentils, etc.) whenever possible. But if this is not an option, look for tomatoes, broths and other liquid foods packaged in Tetra-Paks or glass jars instead of cans. For example, the brand Bionaturae sells organic, preservative-free tomato paste in glass jars, which you can buy at Vitacost. 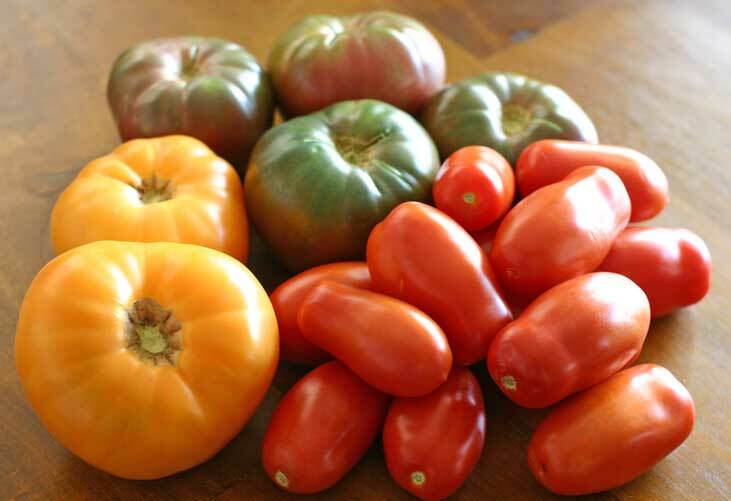 10 Responses to "Garlicky Heirloom Tomato Sauce"
Hi Stefanie. Do you leave the skin on the tomatoes in this recipe? This is great, thank you. Your taste buds must be similar to mien, i have been making all you dishes. They are lovely. Made this sauce tonight without basil. 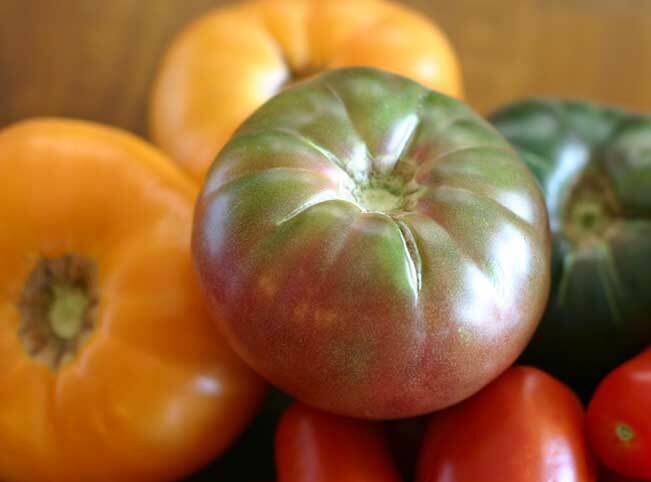 Used very ripe heirloom tomatoes. My kids 6 & 7 loved it over elbow pasta. Could of had it as a soup. So sweet. Thank you. The taste was great on this – and I left out the salt for our dietary needs. In the future, I think i will do the extra PIA step of peeling the tomatoes. Thanks for the recipe!